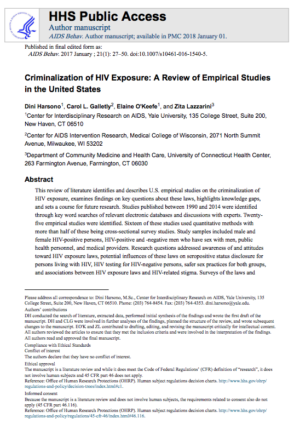 This review of literature identifies and describes US empirical studies on the criminalization of HIV exposure, examines findings on key questions about these laws, highlights knowledge gaps, and sets a course for future research. AIDS Behav. 2017 Jan;21(1):27-50. doi: 10.1007/s10461-016-1540-5.